Cross, west face, cross head. 8'3'' high, 20'' wide and 15'' thick tapering slightly. The arms are 3'3'' across. Cross, dated to eighth century. This is the west face of the cross. 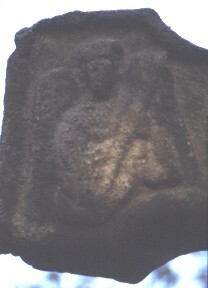 The left arm of the cross head has an angel holding a staff. Routh, R.E., , ‘A Corpus of the pre-Conquest carved stones of Derbyshire’. In Archaeological Journal (1937) 94, 1-42.